Saving Iceland presents a talk by Matthias Monroy, journalist and political activist from Germany, in the Reykjavík Academia, Monday July 23 at 20:00. The Mark Kennedy case illustrated how deeply Iceland is involved in European secret police networks that have been infiltrating environmentalist, anarchist and other leftist resistance movements since the late 1990s. The exposure of the undercover policeman also showed that it is near impossible to bring illegal practises of cross-border policing to courts: It is mostly unclear, which police authority in which country is responsible. In 2005 Kennedy infiltrated the Saving Iceland campaign, which resisted the dams at Kárahnjúkar in Iceland’s eastern highlands. He used his Icelandic connections and experience for a European-wide speaking tour to infiltrate activist groups in numerous countries. 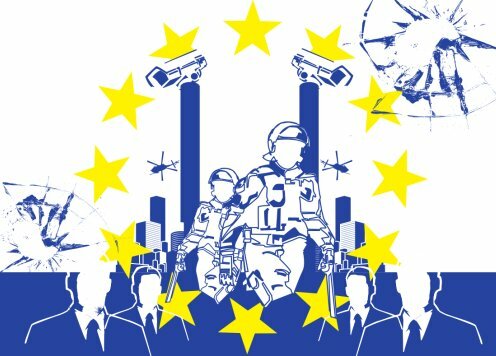 Iceland is also involved in policing the EU migration regime, which will start the huge surveillance network EUROSUR in two years. This satellite surveillance involving usage of drones is complemented by the “Smart Border Package” facilitating border crossing by using biometric features and other technical tools. At the same time the EU changes the Schengen Border Codex, in which Iceland is also taking part. The agreement was one of the most important achievements for free travel within the EU. Now France and Germany constrain more border controls to block international protesters or exclude countries like Greece from the Schengen system. Iceland uses the measure, for example, to control the movements of motorcycle gangs. To block unwanted migrants crossing the Evros river between Greece and Turkey, the EU is running a research program regarding the usage of land robots for border surveillance. The EU border agency FRONTEX, for which the Icelandic Coast Guard has worked in the Mediterranean, is now operating together with the Turkish government and is helping to install a police and customs centre at the common border with Bulgaria and Greece. For the first time, this structure includes the police agency EUROPOL, whose guidelines normally exclude the fight against migration. To the contrary, the main pillar of EUROPOL becomes the control of so called “cybercrime” and “cyberterrorism”. The agency is running large databases, surveillance technology and digital forensic tools to support the police forces of the 27 member states in cross-border operations. EUROPOL is more and more controlling alleged “suspicious” behaviour on the internet, which leads to more need of safety for cyber activists as well as all citizens. In his talk, Monroy will explain briefly the police networks built up by the European Union concerning undercover policing, the fight against unwanted migration and cyberspace. Monroy will also attempt to explain how Iceland is involved in or affected by current and future projects. The talk will take place in the Reykjavík Academia, which also houses Iceland’s only anarchist library, on Monday July 23 at 20:00. The Academia is located at Hringbraut 121, 107 Reykjavík. The talk will be in English and entrance is free. Iceland, you have come so far. You are a light of freedom, justice and peace to the whole world. Do NOT let this happen. Resist. Commander X, seems to me that you have bought into the self-satisfied myth of the achievements of the Pots and Pans Sell-Out Revolt. The world needs something more tangible to guide it out of the forest of tyrannical structures than the PR exercises of a few smug nouveau riche Icelanders who have never understood, let alone cared about what these three lofty words stand for.